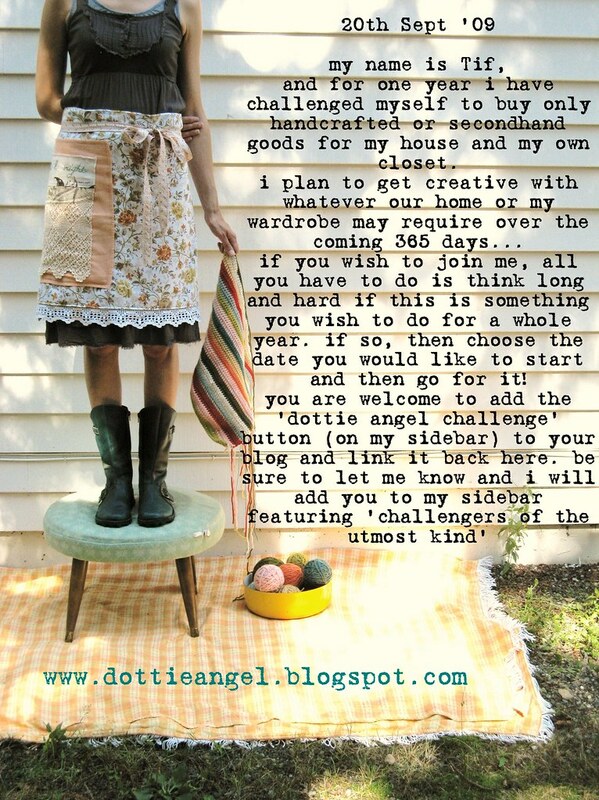 October last year I decided to participate in the Dottie Angel ‘Challenge of the Utmost Kind’ – 365 days of hand-made and thriftiness! I’ve been pretty quiet about this challenge since I started. That is because life has continued as normal for me! I was pretty much on the Challenge before I signed up for it 🙂 The Challenge was to not buy anything brand new for a whole year – instead to buy second-hand or hand-made. It is meant to be a fun way to challenge your creativity – and it has been, but I have also gained a little more from it so far. Mindfulness. I had already made the decision not to buy the children any more toys, we are always the lucky recipients of some wonderful second-hand clothing and books, we love the library, I much prefer to support people who make things themselves … and we just don’t have spare cash for anything else. I have purchased a few things new though – even though the Challenge requires that I shouldn’t do this if I can avoid it. For me I’ve bought a few maternity tops – but needn’t have bothered because the moment I did that my friends cheerfully donated their clothes and now I have more than I can fit in my drawers 🙂 I’ve bought the children shoes too – although I needn’t have bothered with that either because the very next day we received some as a gift. I’ve also bought underwear, socks and nappy things … but I never counted those as part of the Challenge in the first place. Even Christmas time saw me as a slave to the sewing machine. Kaelan received some mechano from us – but I am sure I had bought that before I went on the Challenge, and if not, well I had also hand-made every other gift the children and the family received … so that is ok. When I began the Challenge I also added the extra idea of buying only Australian. Well that went out the window very quickly because there wasn’t much in the supermarket that WAS only Australian!! So I buy LOCAL when I can, and Australian if it is available and more suitable than other products and that is the best that I can do. So life on the Challenge continues as normal for me – but I will say this: although it has not created a drastic change in lifestyle for us, it HAS brought consciousness to my every day living and consuming, and for that I thank Dotty Angel. I wish I’d had the opportunity to have become more involved creatively in the Challenge, but living mindfully is just as important. I’m actually on TWO challenges at the moment – currently working my way through the 28 Days of Real Food Challenge from the Nourished Kitchen blog – but you will have noticed by my recent posts how enlightening this one has been for me. I have 6 and a half months more to go – thanks Dottie Angel!